​An effective product webpage is a page that can sell the product without the customer having the need of any further information about the product or having to seek for more information elsewhere. Not only should a product page be completely optimized for search engines, but it should also be optimized for the customer as well by being as complete and informative as possible. Your potential customer will need as much information about the product as possible in order to convince them to buy the product without hesitation. They need to have all of their questions and concerns answered on that product page. And the more information they have then the more likely they are to buy the product. And one of the best ways to obtain complete product information and images as well is by going to the manufacturers’ website of that product and obtaining the information form there. ​NOTE: If you’re obtaining product information from the manufacturers’ website, then you can not edit the product information text or images in any way, other than reducing the size of the images to be properly fitted into your webpage. (most programs will auto-size the image for you) If you need to add additional information to the information that is already there then you can simply add an “Editors note” and add any additional information that you may have within the parenthesis. When it comes to obtaining, copying and pasting product information be sure to include all of the product information that is available for that particular product, including, but not limited to, complete product description, features, specifications, functions, comparison charts along with multiple product images including a “box shot” of the product, which is an image of the retail product package. If you can give your customers all the information available for that product on your website then they’ll have no need to look elsewhere for any additional information. And one of the main reasons why customers leave a website is to find more information on that particular product somewhere else. You must do everything you can to keep that customer on your website and you can do so by providing complete product information pages. However, information by itself is not enough. You’ll need product images as well. Images of the product are just as important as the product information itself. And it’s important to add multiple product images to the product page in order to give the customer a better feel for what they’re getting. Customers like to see what they’re getting before they buy it and by providing plenty of product images for your customers to see then they can begin to feel more certain about their purchase and feel as if they already have the product in their hands. This is why many retail websites include images of the product box as well. They want to see everything they’re getting, including the box that the product comes in. And believe it or not, all of this gives the customer more confidence and helps them to make their purchasing experience much more realistic as well. 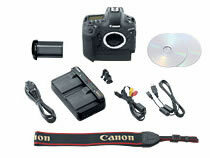 Images and complete product information pages are what help to make the sale. The Ultimate EOS: Canon has brought the best of the EOS-1D Series of digital cameras into one phenomenal model: the new flagship of the EOS line, the EOS-1D X*. Its full-frame 18.1 Megapixel CMOS sensor and all-new Dual DIGIC 5+ Image Processors deliver high quality image capture at up to 12 fps (14 fps in Super High Speed Mode) and a powerful ISO range of 100 - 51200 (up to 204800 in H2 mode) provides sharp, low-noise images even in the dimmest low-light conditions. An all-new, 61-Point High-Density Reticular AF and 100,000-pixel RGB Metering Sensor that uses a dedicated DIGIC 4 Image Processor, makes the EOS-1D X reach new levels of focus speed and accuracy delivering advanced tracking even for the most challenging shooting situations. Taken all together, the EOS-1D X's improved HD video capture, numerous connectivity options, combination of processing power and durable construction, including shutter durability tested to 400,000 cycles, make it the ultimate EOS. New 61-Point High Density Reticular AF including 41 cross-type AF points with f/4.0 lens support including 5 dual diagonal AF points (sensitive to f/2.8), plus EOS iTR (Intelligent Tracking and Recognition) AF for accurate subject tracking. 18.1 Megapixel full-frame CMOS sensor: The EOS-1D X features a newly developed Canon full-frame 18.1 Megapixel CMOS sensor that's designed to create high resolution, perfectly detailed images with unprecedented speed and clarity. 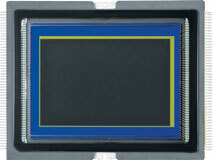 A full 24 x 36mm, the sensor captures 5184 x 3456 large individual 6.95 µm pixels and has a much-improved S/N ratio resulting in better images from the start. And a 2-line 16-channel simultaneous signal readout means speeds of up to 12 fps (RAW + JPEG) and even 14 fps (Super High Speed Mode) are possible! 14-bit A/D conversion, wide range ISO setting 100-51200 (L: 50, H1: 102400, H2: 204800): The EOS-1D X not only offers 14-bit signal processing for excellent image gradation, it delivers higher standard and expanded ISOs, and a score of new options to enhance shooting in varied and fast-changing lighting situations. 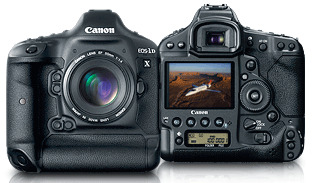 With a standard range of ISO 100-51200, the EOS-1D X represents a 2-stop increase in sensitivity over previous cameras. ​Dual DIGIC 5+ Image Processors for enhanced noise reduction and blazing processing speed: For a whole new level of performance, the EOS-1D X uses Dual DIGIC 5+ Image Processors that include four 4-channel A/D converter front-end processing circuits and deliver speeds of up to 12 fps (RAW + JPEG) and 14 fps (JPEG). The Dual DIGIC 5+ Image Processor offers approximately 17x faster processing speed, and feature new algorithms that promote greater noise reduction at higher ISOs. -Removes dust adhering to the infrared- and ultraviolet-blocking glass. -Self-cleaning executed automatically (taking about 1.8 sec.) when power is turned on or off. Manual execution also possible (taking about 5.2 sec.). -Low-pass filter has a fluorine coating. -The coordinates of the dust adhering to the infrared- and ultraviolet-blocking glass are detected by a test shot and appended to subsequent images. -The dust coordinate data appended to the image is used by the provided software to automatically erase the dust spots.